Find directions at Google Maps! 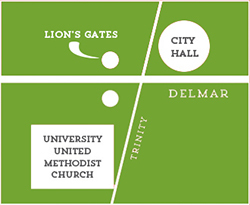 We are located at the west end of the Delmar Loop at the intersection of Washington and Trinity, just south of the Delmar roundabout and Lions Gates of University City. Parking is available in the small lot on the church's north side, as well as on all adjacent streets, including Washington, directly in front of the church. Enter the church building either through the accessible entrance on Trinity Avenue, through the courtyard door off the playground, or through the sanctuary main doors on Washington Avenue. 9:15 a.m. Children’s Music Time in the Upstairs Dining Room. Instructors will take children to their Sunday School classes. 9:30 a.m. Sunday School classes for children and youth; various locations through the building. Worship at UUMC is traditional and liturgical as we share in unison prayers and responsive readings. We believe the worship liturgy is the “work of the people,” so there are always ways to participate: by standing, singing, reading, praying, or lighting a candle. We share our talents in worship through drama, song, instruments, and artwork. Worship typically lasts around an hour. Come as you are! Dress at UUMC runs the gamut from "Sunday best" to casual. We love children and encourage your whole family to join us! A nursery is staffed from 9:15 a.m. through the end of worship. This space has a diaper-changing area as well as play space and rocking chairs. Early in the service, children are invited to the front for “Learning with our Children,” a spirited and lively lesson where the kids often speak as much as they are spoken to! After this, children three years old through second grade are invited to play in the multi-purpose room downstairs. We also offer children's bulletins and worship worksheets in the Prayground for kids who choose to stay in worship. The Sacrament of Holy Communion is celebrated the first Sunday of every month and everyone present is welcome to receive communion. Refreshments are served after worship in the fellowship hall or the courtyard. On the first Sunday of most months, we share a potluck lunch in the dining room. Accessibility is important to us. The entrance to the church at Trinity Avenue is flat and leads directly to our elevator, which gives access to all floors. We have gender-neutral bathrooms on the main and upper levels of the church building, including a family/ADA-compliant bathroom on the main level. Ask an usher before worship if you need a hearing-assist device. We look forward to meeting you in worship! In case of inclement weather or other emergency resulting in a need to cancel services on a Sunday morning, we will send out an e-mail to members of our mailing list and post on our Facebook page. The decision to cancel services will be made no later than 7:30 a.m. on a Sunday. If you have questions, contact Trustee Brad Hershey at 314-324-1173. To ensure that you get the most up-to-date information on University UMC, join our weekly mailing list.